I’ve been fascinated recently with the origins of color photography. I’m also interested in well-known figures in color. That’s why a gallery of pictures posted to Life Magazine are so interesting to me. 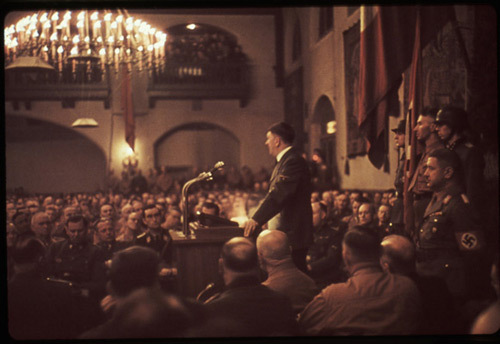 Life uploaded a gallery of color photographs of Adolf Hitler taken by Hugo Jaeger, who had unprecedented access to the German leader over the course of WWII. I find the gallery striking because it’s so… humanizing. Hitler seems like any other world leader. This reminds me of two other striking galleries I saw, not long ago. 1) A color gallery of the 1906 San Francisco earthquake. Click here to check it out. 2) A stunning gallery of European cities in 1906 (a big year for color pictures): See the pictures here.